Last August I had the opportunity to play at Schollstock/Roscopalooza 2017, a festival in Putney Vermont. The music started early in the afternoon and continued to the wee hours of the morning. It was a very colorful summer day which is evident in the videos we are presenting here. The day was hot and humid and we had a big downpour, but the sun came out again so you get to see my performance. For more info and links to some of the other performers that day, visit our Meladava page. Update: August 10, 2018 - All 11 songs are uploaded now. Audio Uploads: "Song of the Week"
Today we plan on uploading one new song every week to YouTube for the next eleven weeks. You can find the songs in the link above or click on the picture. is a collection of 11 songs Melissa and I recorded from 2013 - 2014 in our small studio before recording Melissa's debut CD. 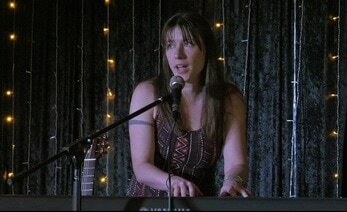 Anyone who knows Melissa knows that her interpretations of Joni Mitchell’s songs are simply beautiful. These audio recordings capture that beauty and now we want to share them with you. Melissa is also responsible for the painting of the moon available for only $2500.00 (just kidding, it's not really available). CD Artwork for "Born With the Moon" can be found here. Just a reminder, If you subscribe to Melissa’s Channel you will be notified of each new upload. David Brinton: bass guitar, piano & keyboards, and all drum and percussion programing. This month we are introducing our new Meladava page and YouTube channel. You can access the page by clicking on any Meladava logo on my site. You can also find it under the MUSIC menu. Meladava is our little audio/video company, created because we wanted to have our own label. We don't provide services other than for ourselves and those we happen to have the opportunity to capture performances of. Meladava is where we will be posting audio/video of musicians other than myself, though I may be there as well. The Bigger Boat is a band I'm a member of. We've posted 7 videos of a live performance on January 5, 2018, with more videos coming in May. We also have a Bigger Boat page where links to the videos are located. We really pushed the production on this one, from capturing the sound and video to final uploads in just 3 months. Meladava captured this event on video and will be posting the results very soon. Look for links here to eight new videos coming early in April with more arriving in May on our new Meladava YouTube Channel. Video Release: "O Holy Night"
I have always been impressed with the beauty and wonder of Christmas since I was a child. It is a time to be with loved ones, to give and share in the joy of the season. But for some this is a very sad time. The pressures of gift buying, dinner planning, etc. or lack of money can be stressful. Others can suffer from depression for a variety of reasons, including a lack of friends and family, leading to loneliness and sometimes despair. May we always be considerate of others, especially during the holidays. Looking back on 2017 I have a lot to be thankful for. With the release of my first album, my website, and growing number of gigs, my musical career is moving forward. Thank you all for your support! But this year has also brought tragedy and heartbreak. It can be difficult to see the good in the loss of a dearly loved one. May this remind us to appreciate those in our lives who are still present. And let us honor those who have passed by remembering them in our hearts. "O Holy Night" is my first official video created by Meladava Productions. It is a gift to all my friends, family, acquaintances and even strangers. I have two new developments to share with you. First, there is a new slide show of my CD Party Photos under the Galleries tab. 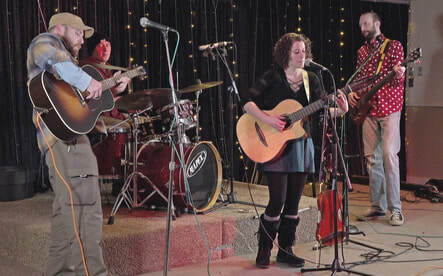 These pictures were provided to us by Michael E. Sinopoli from video he shot at the CD Party. We went through the videos and captured a bunch of frames to share with you here. Second, three of those videos are now posted on my Youtube channel. These can be accessed here. Unfortunately we did not record the audio at the event so the only sound available comes from the on camera microphone. Thanks Mike, you are a gentleman! Thank you to all who came out Friday night to the party in support of my new CD. I would also like to thank the following people who helped make this a successful evening. ChinHua Lee for hosting the show at "the Tavern at the A". Grahm Sturz for your support and fine performance. Breonna Cunningham for the cupcakes (with the musical notes) and decorations. Kenneth MacAlpine for your help with the sound. ​Mike Sinopoli for stopping by to shoot video of the event. Nick Apple for handling CD sales and the raffle. Thanks again to Chris Brinton & Ward Woolverton for your presence on the album. Special thanks to Lauren Prezioso & Christian Kemper for your help with final edits to the website prior to it's official release. You caught a lot of errors and helped to make the site better than it would have been without you. "GALLERIES" is a new section in the menu. Check it out to see Melissa's Recycled Wine Bottles. 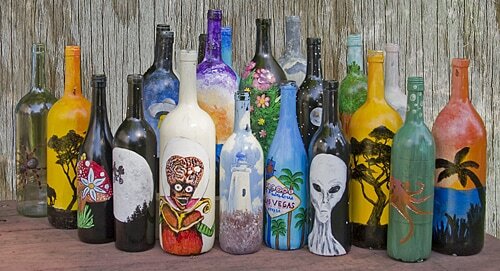 Why buy a canvas when you can paint on wine bottles and transform trash into art. Melissa started painting these bottles (picture above) about a month ago and decided to give them away at the party. 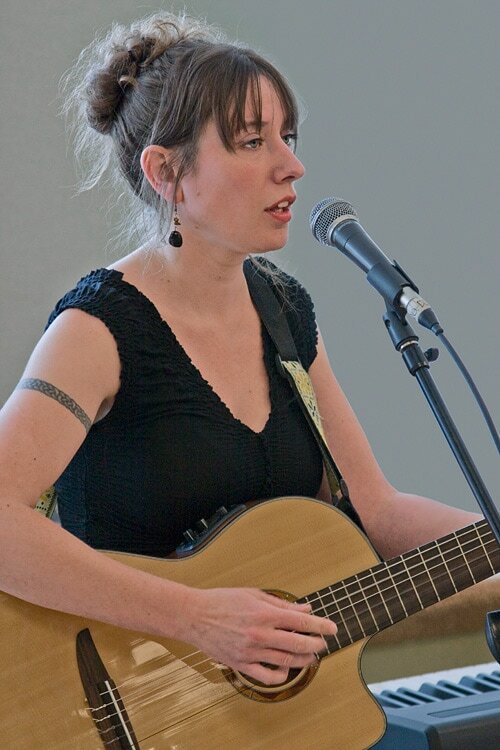 Melissa will be playing this Saturday at Wood Brothers from 1:00 - 2:00 pm. Wood Brothers is located at the Allendale Shopping Center, 5 Cheshire Road, Pittsfield, MA. Melissa plans to bring some new "Musically Themed" bottles for sale at a modest price. You may have noticed that we've added a newsletter subscription. If you'd like to join, we promise not to share our email list with anyone else. The only time you will get e-mails from Melissa will be when we post news of significant website changes or a special event. Subject: Melissa's debut CD release & CD Release Party! Today is the day! Melissa's album is now available online. Visit our Melissa Online page for links. The CD will be available at Wood Brothers in Pittsfield, located in the Allendale Shopping Center, 5 Cheshire Road, Pittsfield, MA. Of course it will also be available at Melissa's CD Party this evening (7:00 pm) at the Tavern at the A. Special guest Grahm Sturz will be with us tonite. This event is open to the public with no cover charge. I've heard there is also going to be a raffle with free prizes. We've also made a few minor changes to the website including a subscription to Melissa's email list. We plan on adding more content here like Melissa's lyrics and photos. Did you know that Melissa is also an artist? She has been hand painting wine bottles to give away tonight at the party. Next week we will post pictures of these and report to you all how the party went. ​We are already at work on more recordings but plan on concentrating our efforts on videos for the near future. Melissa's YouTube page definitely needs some good quality videos. Melissa and I thank you all for your support. ​I'm excited to announce the coming arrival of my debut CD. It is a collection of original songs written and performed by me, with guest appearances by Chris Brinton, Ward Woolverton and David Brinton. It was recorded, mixed and mastered here in Pittsfield and Becket, Massachusetts by our record label "Meladava Records". The CD will be on sale at Wood Brothers in Pittsfield, located at the Allendale Shopping Center, 5 Cheshire Road, Pittsfield, MA. It will be available wherever I perform as well. You can also download or stream the album from many of the major online digital music retailers. These will include iTunes, Pandora, Spotify, Amazon and many more. 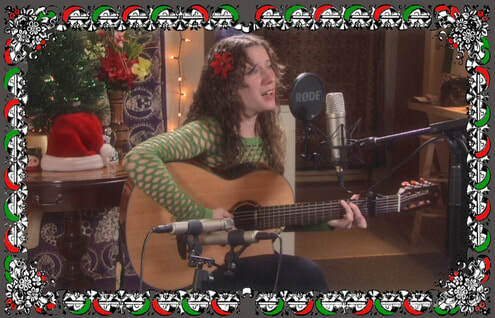 For those who would prefer a bit more intimate version of the album, we have created "Melissa Unplugged". This version will be as the title suggests. Thank you to all my fans who have encouraged me to drive forward. We'd love to have you come to the CD party if you can make it. I'll be performing a few songs and we can then hang out and listen to the CD. Subject: Melissa's new website is up. 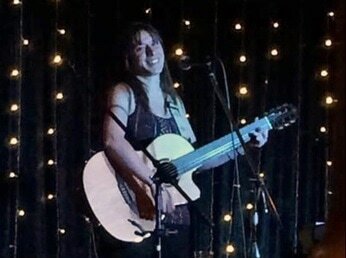 Welcome to the official website of Melissa Brinton! This site is brand new today and we hope you find it useful. By June 2, our "Melissa Online" page will have links to make it easy for you to find Melissa's album online. We've also included two songs from the album on YouTube where you can listen to Melissa now! A calendar page has been provided so we can keep you up to date about when & where Melissa is performing. If you'd like to check out the artwork for the CD there are links here for PDF files of Melissa's CD cover. In the future we plan on adding more to this site like videos on our YouTube page. We'll have to make some first, obviously. If you have any questions, criticisms or suggestions regarding this site please contact us at Meladava.